A thin piece of ordinary glass appears colourless to the eye, but the same glass viewed edge on will display a colour usually green, which is an indication of the presence of an iron based impurity. Impurities of other minerals can give different hues to glass, such as pink, blue, amber or grey. These properties can be used to decorative effect to produce glass of many colours and shades. For instance, small amounts of the salt manganese dioxide will remove the green tint caused by iron, but in higher quantities the same salt will impart an amethyst hue to the glass. 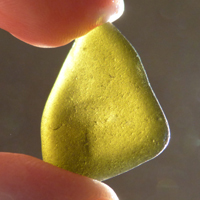 Glass which has had it’s colour removed by the addition of manganese dioxide will change over time when subjected to ultraviolet light, as is found in sunlight. Over the years the colour will change through light pink or lavender to amethyst or purple subject to the quantity of the salt used in manufacture and the strength and duration of the exposure to light. Many clear glass containers were made in the early 1900s, but I don’t find many pieces of amethyst or purple in my searches. Why? I don’t know. Maybe the glass I’m finding has been buried in sand and so not exposed to light, maybe it’s too young to have developed a hue or maybe manganese wasn’t used in it’s manufacture. Sea glass colour rarity - RARE. Citron - Mmm! 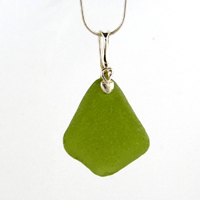 conjures up images of limes, lemons and The Mediterranean and this piece of sea glass does the same. 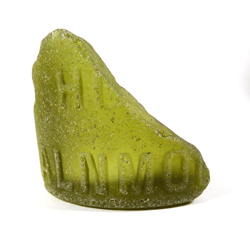 Sea glass with a yellow green colour is called ‘citron’ and is one which falls into the ‘rare’ category for sea glass. 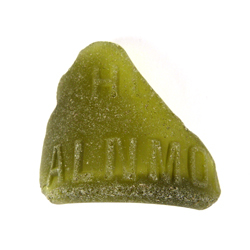 This piece is a deeper shade of citron, dark yellow green, but not as dark as forest green. This glass was used in the manufacture of wine bottles, bitters bottles and ink bottles. This piece is well frosted and a good shape and just shouted to me to make a pendant with it. I’ve been collecting sea glass to make my jewellery for about four years now and yesterday was the first time I found Black Sea Glass, another first was that I found not one piece but two. 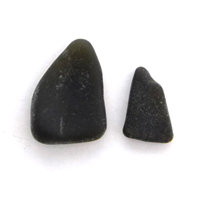 Black sea glass isn’t actually black, but in most cases the glass is very dark green or very dark amber. I am exceedingly lucky here as I found one of each! 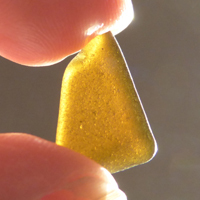 The larger of the pieces has a green tone and the smaller has an amber tone, this can only be seen when the glass is held up to a very strong light. Black glass was used prior to 1900 for beer, wine and other alcoholic beverages as they frequently needed protection from sunlight. As you can imagine I have collected a fair amount of sea glass, so what are the odds of finding a piece of ‘black glass’ – I don’t know! 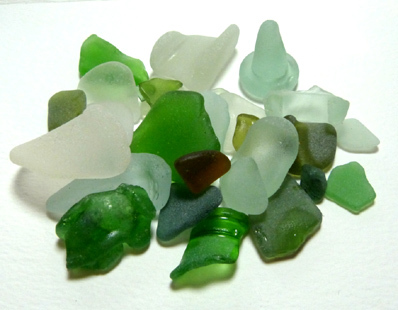 Collection of sea glass from yesterday's beach walk. Can't believe there are only a couple of pieces good enough for jewellery. There is one good collectors piece - can you spot it - the seafoam bottle stopper? Found! The tide had just turned when I arrived at the beach and although the wind was blowing it wasn't uncomfortable. I headed south and found a few pieces of driftwood, but no sea glass so I decided to head home. On reaching the place where I leave the beach I decided to head north and I'm so pleased I did. 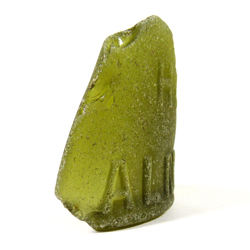 This is what I found - a piece of green glass with lettering. I've done a bit of research and found out that it's part of a bottle from T. Binks, Schooner Hotel, Alnmouth. Thomas Binks 1840-1914. I'll update when I've got some more details.